The Team | Absolute Nutrition | Protein Snacks. We call ourselves the 'A-Team'! As in..'Absnutfoods' Team! Many people have amazing ideas but I believe that your success depends on the support network and team that you have around you. My husband James and my parent's are extremely supportive. I am able to juggle 4 small children and a thriving business only with their continued help and support. One evening, 3 years ago I made my first homemade Paleo bars for myself an James. I didn't have a decent baking tray so I borrowed one from my Mum who lives next door,(handy)! That was the tip of the iceberg and since then we have spent every working day together in our production kitchen where, with her help, I developed my range of treats and snacks. It's not unusual for us to be there at 1am after a days work trying out a new idea or recipe. She has worked tirelessly to help my dream come true. 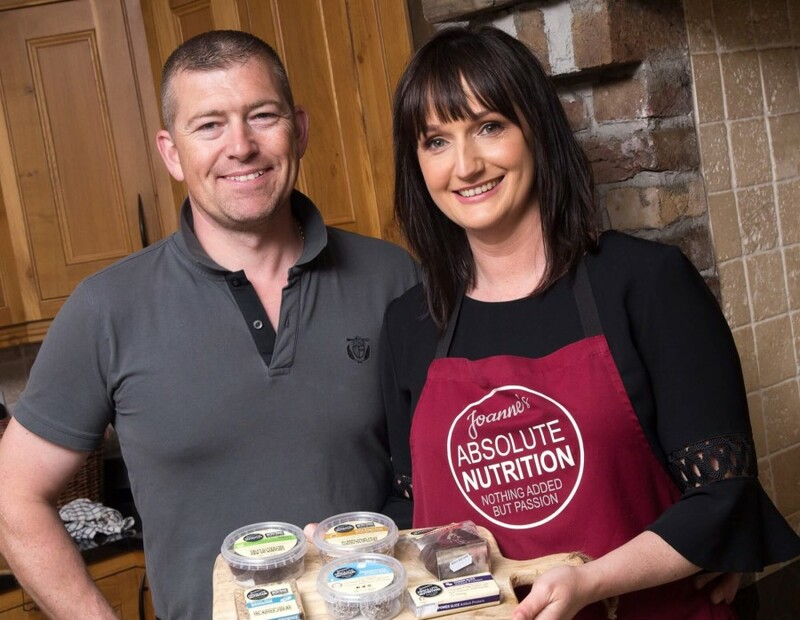 While I am in my kitchen, at instore-tastings, events or at cool photo-shoots having all the fun, my partner in crime, James is managing Absolute Nutrition. He commits himself to every challenge and project, keeps on top of business and still manages to support and encourage me all the way. I couldn't do it without him. In his spare time, James keeps fit, makes amazing things from wood and has an impressive tropical fish collection. Maria has been with us from the beginning and does an ace job both making and overseeing the quality and consistency of our snacks and treats. Like me, Maria's mother thought her how to cook and appreciate real food. She has a natural flair in the kitchen and makes all of our food with lashings of Love! Maria also enjoys a little 'retail therapy' in her spare time! My childhood friend, brings the entertainment to our kitchen every day. When she's not working on perfecting our PowerHouse Protein Balls or Chia SuperFood Energy Bombs she is filling us in on all that happens in the world of style, fashion and food. She is also a Gin connoisseur! A fellow Mum of 4, who also lives nearby, has perfected the Rawlo! Her attention to detail and organisational skills keep us on our toes. When she is not helping us take over the 'snacking world' she is organising local events or taking time out at Yoga. ..aka, Dani's Hubby, looks after our logistics and merchandising. He does an 'amazeballs' job of making sure our treats and snacks are always available and freshly stocked instore for you. He likes to 'celebrity spot' along the way and has an impressive celeb selfie portfolio! Our brand ambassador has a lot of fun in-store explaining the nutritional benefit and convenience of our treats and snacks while meeting some amazing people. In her free time, she loves to travel and spend time with her son. I like to spend my spare time with my little ones! Going on 'adventures' through the fields, collecting acorns, paddling in the river, going to their jiu-jitsu competitions or making some food with them. I also enjoy lifting weights, trx, festivals and drinking beer!